Four Fort Lauderdale, Florida, police officers are off the force after exchanging racist text messages between themselves and creating a video with racial bias, officials said Friday. Three of the officers, Jason Holding, James Wells and Christopher Sousa, were fired following an extensive internal affairs investigation that began in October 2014, Chief Frank Adderley said at a news conference. A fourth officer, Alex Alvarez, resigned during the course of the investigation and would have been fired, Adderley said. The inappropriate material included images of President Barack Obama and fellow Fort Lauderdale Police officers, Adderley said. The video was made by Alvarez using iMovie, Adderley said. Four Fort Lauderdale Police officers are out of a job after officials say they exchanged racist text messages and a racist video. 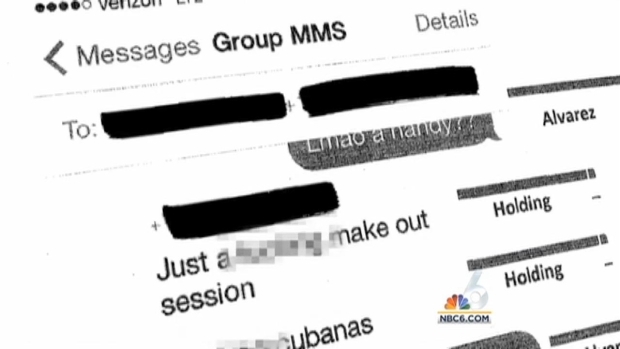 According to a police report on the firings, the officers criticized co-workers' appearance and work ethic, and they "exchanged text messages that included derogatory comments towards Hispanics and homosexuals." According to Adderley, the officers said they were just joking around. "Based on the investigation, they felt, in their words, that it was a joke," Adderley said. Adderley said the officers were terminated due to department misconduct, including conduct unbecoming of a police officer and engaging in conduct prejudicial to the good of the order of the police department. "The four officers' conduct was inexcusable and there is zero tolerance for this type of behavior within the Fort Lauderdale Police Department," Adderley said. The conduct wasn't against the law, Adderley said. Four Fort Lauderdale Police officers are off the force after they exchanged racist emails and made a racist video, officials said. "I'm very disappointed, disgusted and shocked by this incident," Mayor Jack Seiler said. "The inappropriate racist behavior exhibited by those involved is unacceptable and reprehensible. It violates the trust we place in our law enforcement officers; it damages the bond we have established with our community; and it undermines the standards to which each and every City employee is held accountable." The investigation began after the former fiancee of Alvarez saw the text messages and came forward after she felt they were inappropriate, Adderley said. Adderley said the officers were removed from contact with the public during the investigation. "The Fraternal Order of Police is a multicultural organization which does not tolerate racism. Our officers take great pride in our commitment to diversity," Fort Lauderdale FOP president Sgt. Jack Lokeinsky said in a statement. "Our dedicated officers have positive relationships with residents in every community we serve." In response to the incident, the department has created a human diversity class that every officer will attend on a yearly basis, and they will be evaluating their screening process for newly hired employees. "We will do everything we can to educate our officers of the consequences they face if they do not adhere to the zero tolerance to racism within our agency," Adderley said.